Westin Zen, originally uploaded by primatepatio. 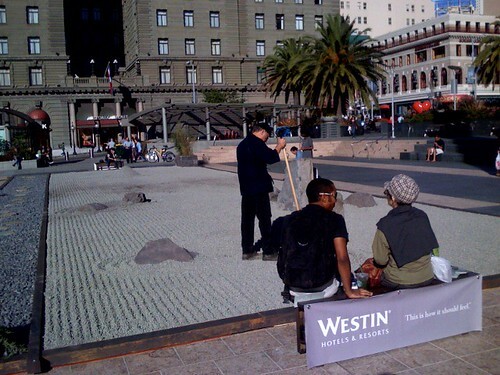 Westin has apparently sponsored a zen garden in union square. There are (recorded, I presume) chimes playing, sort of incessantly. Down the square, at the outdoor Italian cafe, plays a recording of Italian tenors. At the stage right next to the garden, a big sound system has been set up. Peppy, cop-show jazz/funk, blasts out of the speakers. I want to say that this is about the least zen thing EVER, but say that seems sort of ironic. Actually, this is exactly the kind of situation one might stumble onto in a train station or shopping mall in Tokyo, except that there would a goth teenager drawing with charcoal, a replica of Leonardo's Madonna and baby Jesus , while a local band plays Jackson5 style music, and each band member has a different African-American hairstyle (one afro, one dreadlocks, one cornrows, etc). Without meaning to, we have successfully imported Japan.